Quit struggling with pliers to remove exhaust springs...this will do the trick! By far the most durable spring tool available. Near indestructible and very easy to use. Our favorite spring puller! 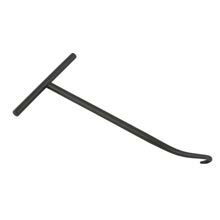 SLP Stainless Steel Spring Hook Tool - 4"
Special tool made for installing and removing all exhaust system springs or any spring that requires a pull to release. Made of stainless steel for strength and rust resistance. 4" extension. This spring puller PULLS as well as PUSHES. Also used to remove the Rotax silencer baffle.